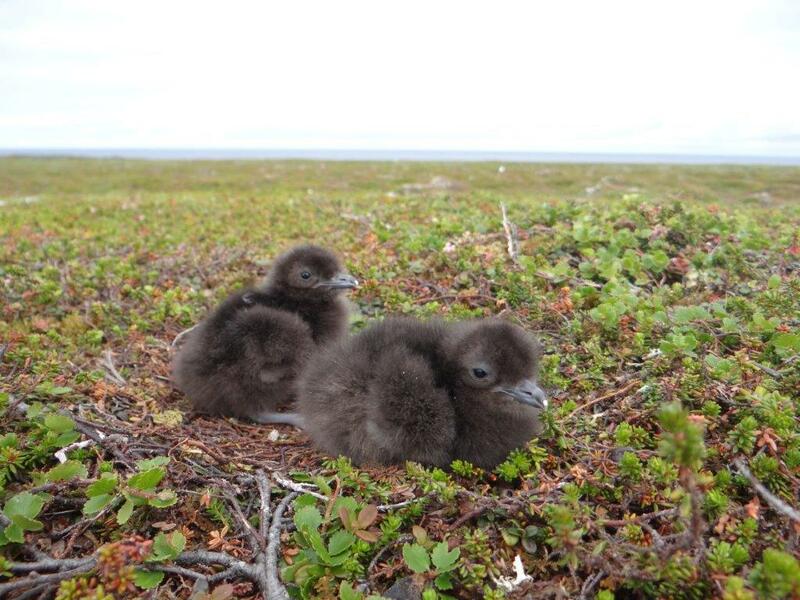 It is late June and skua nests should be hatching right now, and one should stumble over chicks on the tundra. Instead pairs are hanging around with nothing else to do than sit at their territory and fly to sea to feed from time to time. Of a total of 40 nests, 33 were predated by red foxes, two more by gulls. In the four years we have worked here so far, we never encountered such high predation rates. One could argue that foxes follow our tracks and we as researchers lead them from nest to nest. Even though we are very careful at nests, our scents will definitely play a role. However also nests that we did not approach, but only observed from a distance disappeared. And all nests disappeared very shortly after they were started. Not only the skuas, but also waders in the area suffer from fox predation. Barbara Ganter and Hans-Ulrich Rösner, who have investigated the Dunlin population here over 25 years, also see more predation than usual. We visited the active fox den in the area and it made an impression of a lavishly set table: parts of a reindeer calf, remains of several gulls, feathers spread out all over the place. Four nearly full grown young foxes are regularly playing outside the den. A fox den has several entrances and a few were stuffed with even more food: a reindeer calf and a complete cormorant. We guessed the 66 skua eggs were also hidden somewhere inside the den! And foxes are not the only threat: because of late snow melt the reindeer herd could not feed in the mountains and arrived here extremely early and in much larger numbers than usual. Now 600 reindeer cross the area on a day to day basis. Not only can they trample nests, they will eat eggs if they come across them. Resting herds are often found lying in the middle of known skua territories for hours, preventing them from going back to their nests. 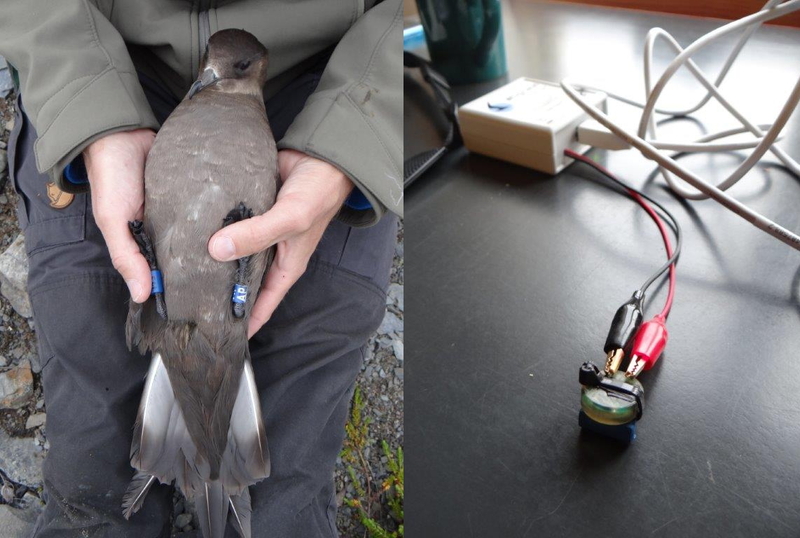 We are working in the Slettnes Arctic skua colony since 2014. 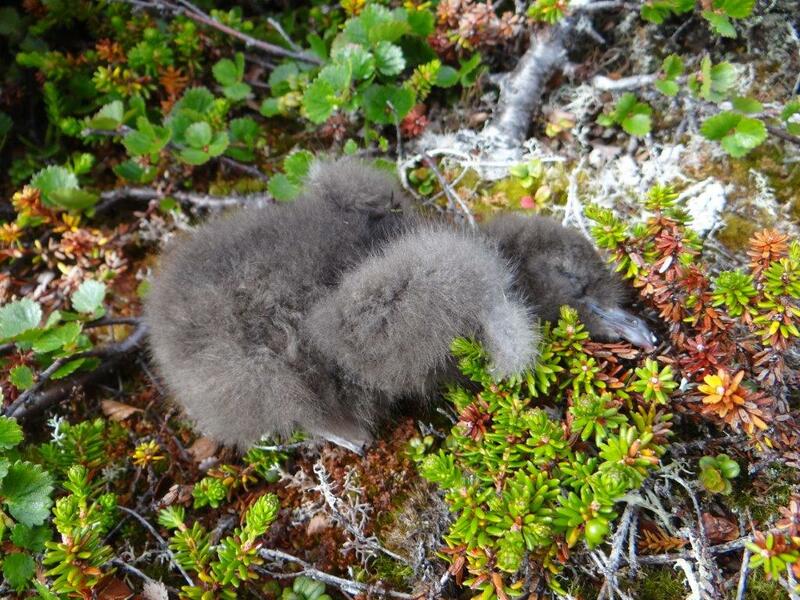 That year nests were abundant, skuas were aggressively attacking us, and many chicks survived and fledged. The seasons since then have been worse every year. 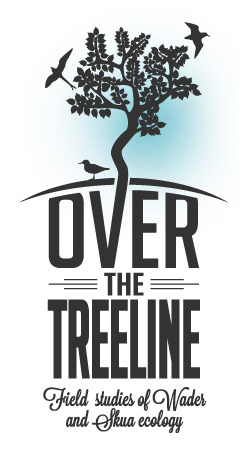 Less nests, less known birds resighted and hardly any breeding success. The main driving force behind these changes seems to be food availability. Arctic skuas do not feed for themselves, but rely on host species such as Arctic tern and kittiwake. Skuas chase their victims until they throw up the fish they just swallowed. There are no consistent monitoring programs on Arctic skuas, but the kittiwake is in strong decline all along the Norwegian coast (see this NINA report). We counted no more than 80 breeding pairs of Arctic skua in the Slettnes colony last week, while there used to be 250 in 1997/1998. The key food for seabirds, but also for large fish and whales in the area are capelin and herring. From the 2017 report of the ICES Working Group on the Integrated Assessments of the Barents Sea (WGIBAR). Capelin underwent several collapses and rises since the 1980s. The stock estimate is based on the joint Russian–Norwegian acoustic surveys in September each year (see this report). During winter and early spring Barents Sea capelin migrate to the coast of northern Norway (Finnmark) and the Kola Peninsula (Russia) for spawning. During summer and autumn capelin migrate north- and north-eastward for feeding. The last collapses were caused by poor recruitment, most likely in combination with low growth and increased predation pressure. The 1986 collapse was aggravated by high fishing pressure. Since then fishing pressure has been low. Predation by young herring has been suggested to have strong negative influence on capelin recruitment. The recent strong decline in the capelin stock appears to be caused by a combination of the same factors as in the previous capelin collapses: a decrease in individual growth rate of capelin, increased mortality caused by heavy predation from the large cod stock, and lower recruitment. In 2016 there was better recruitment of both capelin and herring, which could have led to a good food situation in 2017. However we have not witnessed that so far. For bird species relying on pelagic species, also the distribution of the fish is important: it should all be within reasonable flying distance of the colony. A one egg clutch: very common this year. Arctic skuas are also less aggressive towards predators because they are in worse condition (the body mass of birds that we captured every year is 5% lower in 2015-2017 than in 2014). The skuas also produced smaller and fewer eggs in 2015-2017 than in 2014. 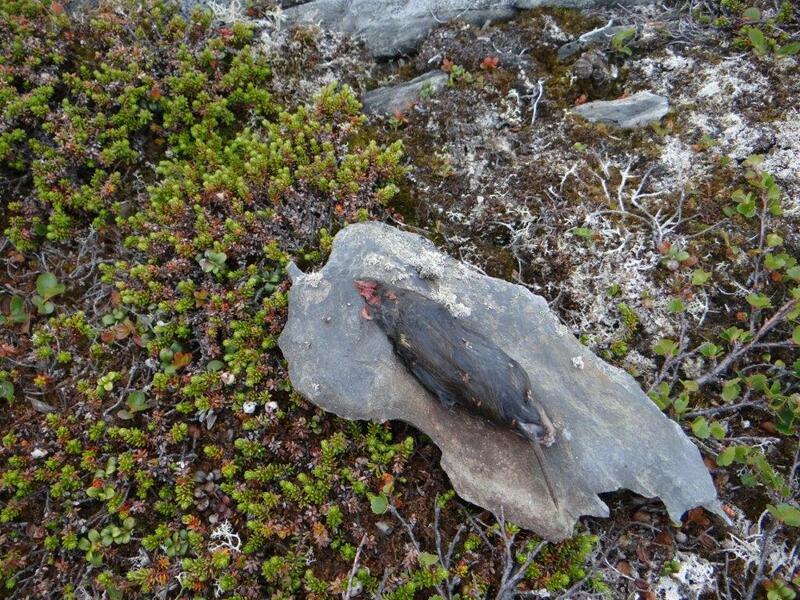 The increasing reindeer herd further aggravates the situation: ca 400 animals wander through the area every day, possibly resulting in trampling of nests (and they will also eat eggs when they come across them). Of course we have also considered our potential disturbing role as researchers in the area. However, especially in parts of the colony where we did not work, the decline is even more prominent than in the area where we caught most birds and spent most time. Circa 400 reindeer inhabit the area, potentially trampling nests. The season is coming to an end. At least for us staying in the area. There are still skuas with chicks, although not many. In total we recaptured 19 loggered Arctic Skuas and retreived their migration information over the last year. We gave all these birds new loggers and caught an additional 7 birds that also got loggers. Quite unexpectedly we got yet another logger back. The other day we met a British couple that were staying in the area already for a week. They were making a film on the nesting and hatching of a red-throated diver nest. They found one of our loggers with a bit of the blue ring attached. They picked it up but later put it down on a tussock, because they thought we put it there intentionally for some kind of measurements. Then they ran into Barbara Ganter and Hans-Ulrich Rosner, our fellow researchers working on Dunlin in the area, who told them that we would be extremely interested in getting the logger back!When we met the couple they had just spent 2 hours searching for ‘the precious’, but could not find it back. Together we searched for another hour systematically and checked every tussock in an area the size of a quarter football field. Just at the point when we were about to give up, one of them found it back!! The couple was so relieved! And they were the heroes of our day of course! That brings our total to 20! Last year we ringed 53 birds. It is clear that a large part of those either did not return, did not breed, or whose eggs hatched before we had a chance to catch them. One of the things we will dive into in the analyses if the El Nino may have had any effect on the early breeding season for some pairs or the lack of breeding for other pairs. Left: Four-year-old Arctic Skua with still some barred feathers. Right: The most exciting time of the day: reading out retrieved loggers! We are also seeing back the first birds that were ringed as chicks in 2014. 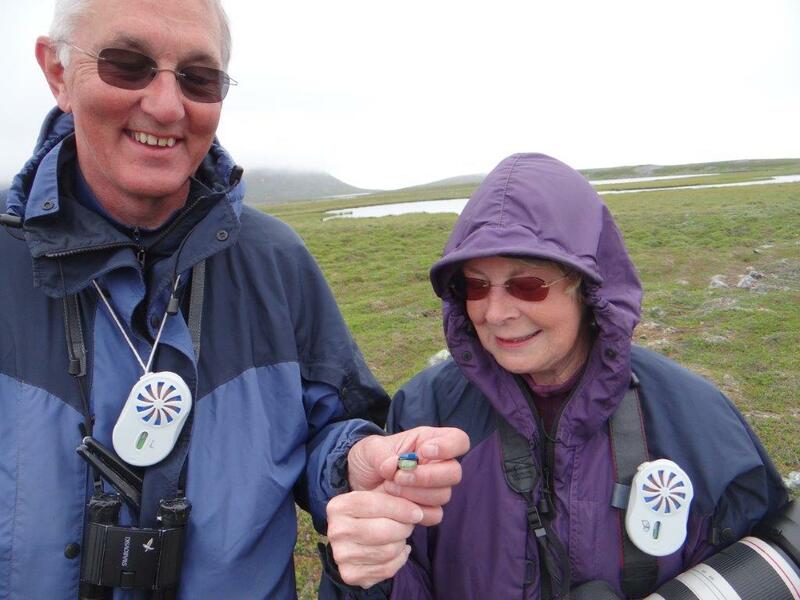 That was a very good breeding year resulting in some 100 chicks ringed of which a large proportion also colour ringed. They do not breed yet, but hang around and sometimes seem to team up with a breeding pair. In contrast to other areas in Europe we had extremely good and warm weather. Yesterday it was even 27 degrees! The caretaker of the lighthouse told us that no one in the nearby village Gamvik could remember that such temperatures were ever recorded before! Even swimming in the Barents Sea is not an achievement anymore. Announcement of talk by Hans. 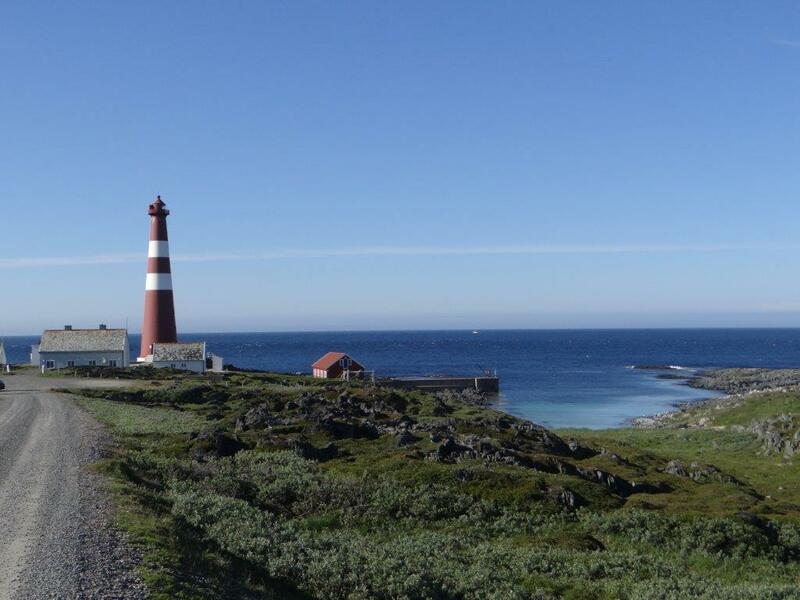 On last Sunday Hans gave a presentation at the lighthouse for locals of Gamvik and tourists. 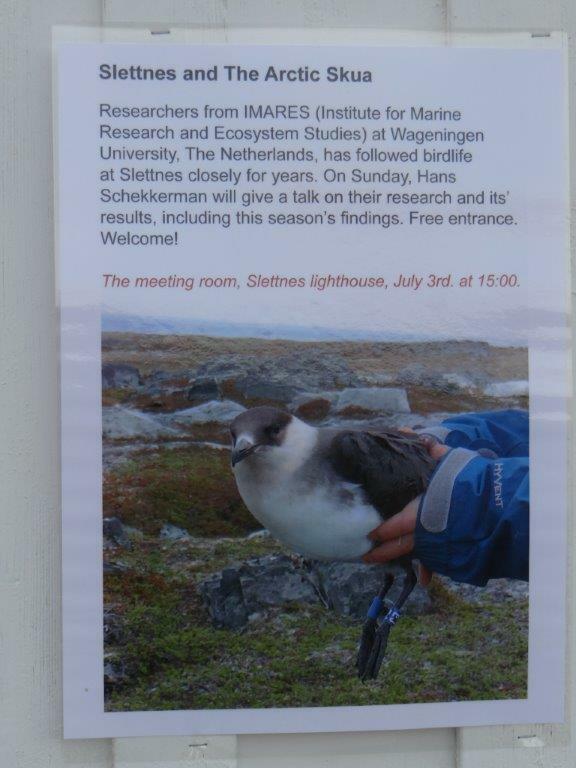 It was well visited and it was striking to notice that people do not seem to be aware that they are in a very special place, home to the largest colony of Arctic Skuas! We are leaving Slettnes now and will return next year to meet up with our world travellers once more. 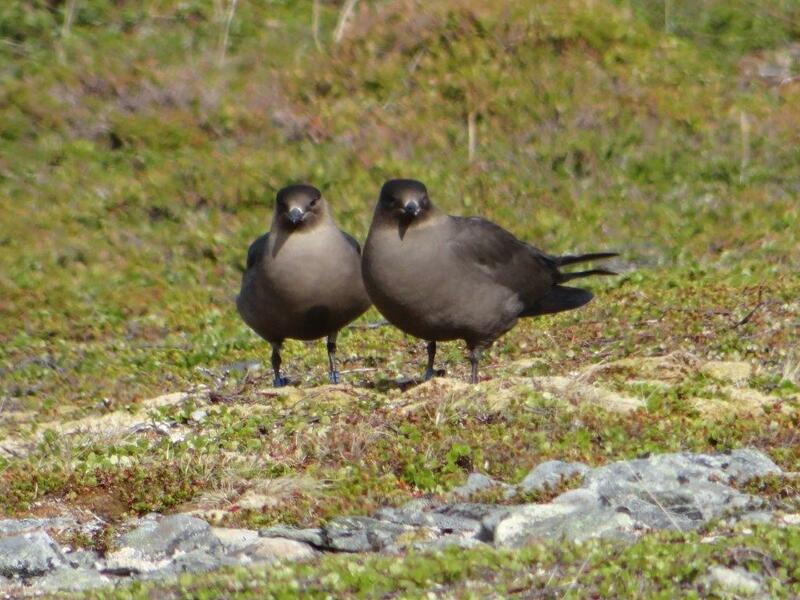 Pair of dark phase Arctic Skuas, both with loggers. You wouldn’t think we are at 71°N, with today’s temperature: 22°C, warmer even than in Rome and hardly any wind. This means mosquito bonanza! Nearly all Arctic Skuas have hatched by now, but we have seen no chicks older than 1 or 2 days and several nests with dead chicks. The feeling that the food situation is bleak this year settles in more and more. Arctic Terns are not breeding either and one skua threw up a vole. The outskirts of the colony are either vacant or birds hang around but have not produced eggs. The only breeding pair of Great Skuas lost their chicks within a few days, another sign that even they cannot feed their chicks. 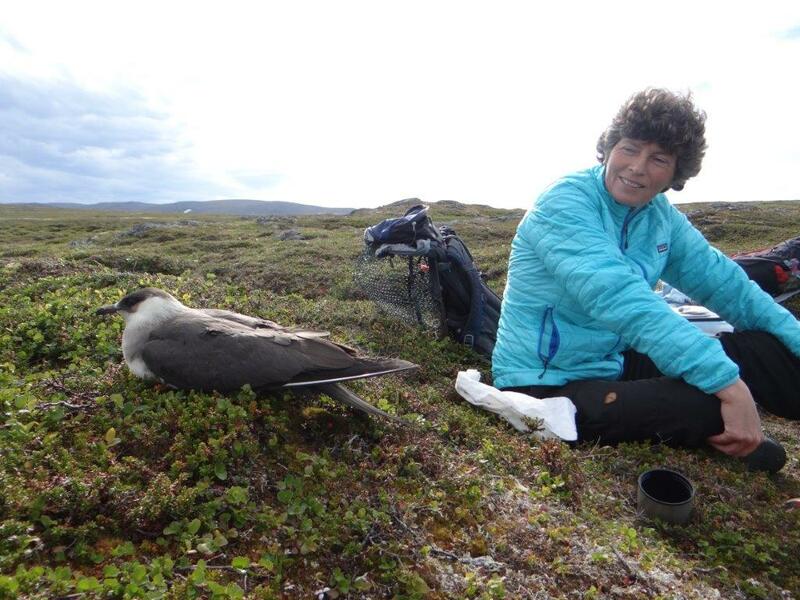 The logger information shows that the breeding Arctic skuas go out to sea sometimes for more than a full day leaving their partner at the nest. In the meantime we managed to recapture 19 individuals from last year. It was a struggle against time, since many nests hatched so early. Catching them on a nest with a chick does not seem to work at all. Apparently the chicks need less brooding than e.g. waders and if we take the chick away they won’t return to the nest to sit on the egg left. Also we found out there are at least 50 ways why the catching fails, despite the fact that the snare system works well in principle. Either the battery power is too low, the bird simply escapes, the distance is too far for the remote control, the bird won’t sit down or in the worst case, the coil of the snare is broken. The loggered birds showed the same variation as last year, wintering in south-America, South Africa, the Caribean, West Africa and one even off the coast of Spain. Of the four couples we recaptured the partners each went their own way, so they probably meet each other only here on the breeding grounds again. On the Red-necked Phalarope front we also had some successes: 4 recaptured birds. One loggered bird lost its logger and one lost its nest, making catching impossible. Three of them went to the Arabian Sea, one even as far south as Mozambique. Of two of the birds we had tracks from last year. The tracks in the consecutive years were nearly copies!